In June I wrote about my first ride on the Bangkok Airport Rail Link (ARL), which spent the past few months running a limited test service. The line has both a local and express service, the express promising to move you from the airport to the center of the city in fifteen minutes. The trial run for the past few months, though, only featured the local service. Two weeks ago the express portion was brought on line and the system was officially opened, so I went for another ride to check it out. Now that all the stations were in operation, I decided to ride the express from the Makkasan terminal station (located near Asoke between Rama IX Expressway and Petchaburi Roads) nonstop to the airport, and then ride the local service back to Phaya Thai station, where the ARL connects with the BTS Skytrain. Back in June one problem I noticed was that the ARL station (on the right in the picture) didn’t physically connect with the BTS station (on the far left). In fact, there was a gap of a good 5 meters, meaning that you had to walk down the stairs from one station, along the road, across the train tracks, and then ascend an escalator into the other station. Not convenient at all – especially for someone with suitcases! I’m glad to report that on opening day, they had a connector bridge just barely finished (work was still underway but a narrow walkway was opened through it) that takes you from the paid area of the BTS station (in the background) to the public area of the ARL station (in the foreground). The operator of the BTS has added fare gates and a ticket window so you can enter and exit the station conveniently, walking directly to the ARL station. Amazing, but true – there was some amount of advance planning and coordination between the agencies! 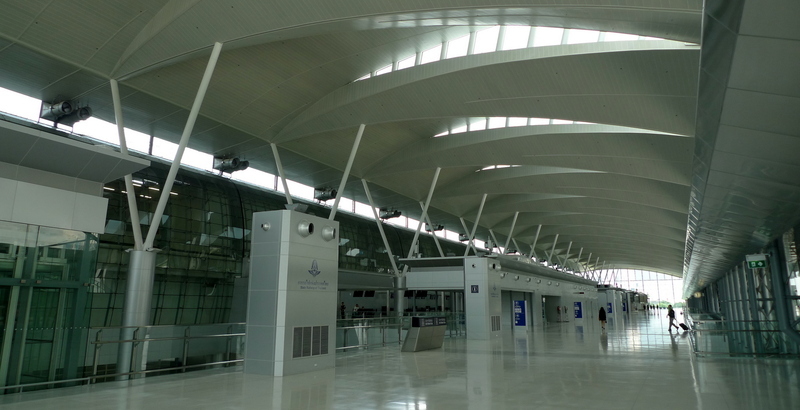 Unfortunately, I can’t say the same for the Makkasan Station, a beautiful, modern facility that is meant to offer the convenience of checking in for your flight at the station, checking your bags, and then being able to whisk off to the airport without the worry of lugging your suitcases with you. 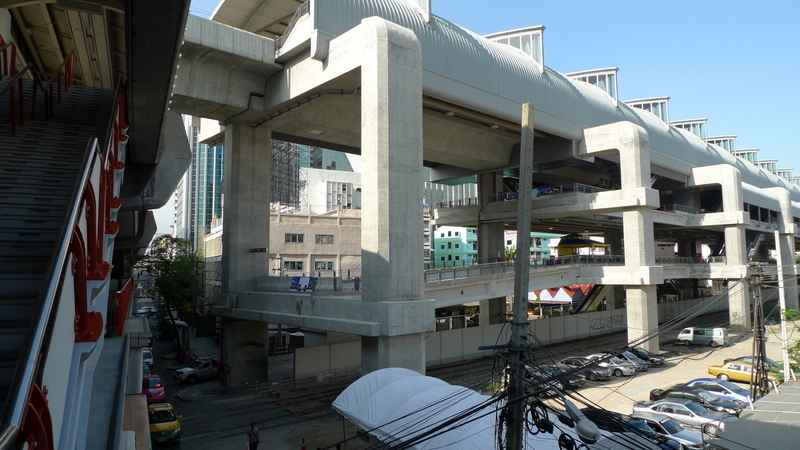 The station is set back some 200 meters (650 feet) from Asoke Road, a heavily congested north-south artery, and some 500 meters from the Petchaburi MRTA subway station exit. 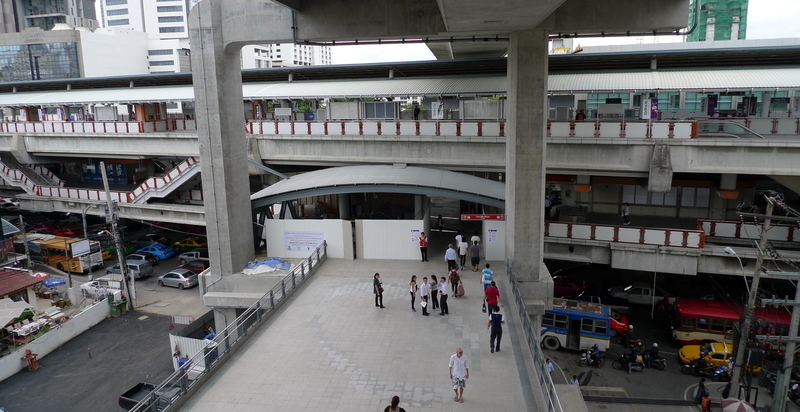 Despite more than three years of construction, there is no direct pedestrian access between the MRTA and ARL and no vehicular ramps connecting the station to the southbound (inbound to the city) side of Asoke. As I was walking from the subway station to the ARL station, a very pedestrian unfriendly route, I came across a family of travelers, pulling their suitcases from the ARL station. I asked where they were heading, ready to give directions, and they were looking for a taxi. Of course, the driveways weren’t open and no taxi queue was up and running, so they had to walk the 200 meters to the street and try to flag a taxi down. To top it off, the taxi would be going the opposite direction from where they were headed. Open building but no taxis or any other traffic allowed up to the facility. 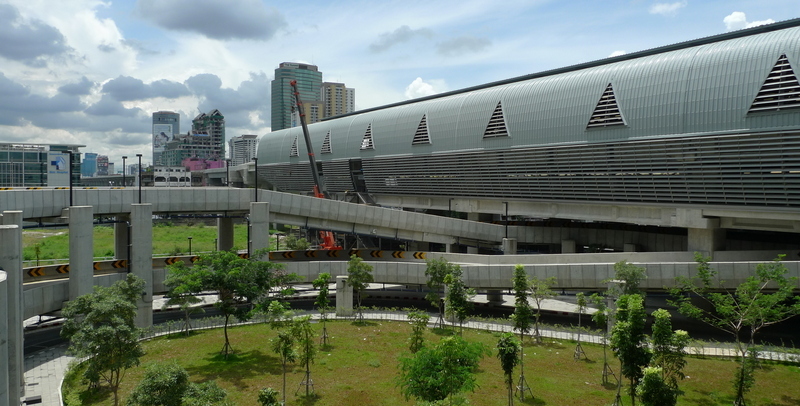 A week after the ARL opened, the State Railways of Thailand, which owns and operates the system, announced they would build an elevated pedestrian walkway to the subway station and would build ramps so cars could access the station from all directions. Give them two years and then things might work better. The State Railways owns a huge tract of land around the Makkasan station, what used to be their main switch yards and maintenance facility. Their grand vision is to eventually develop all of this – enough room for 20 or more skyscrapers – into a large mixed-use facility of offices, hotels, convention center, shopping, and maybe some residential. At that point in time, it would be conveniently located. Until then, it is not really near much of the city. In fact, that is probably the reason they chose to make Makkasan station the in-city terminal. They stand to make a lot of money (and maybe, for the first time in 50+ years, turn a profit?) from land development. The obvious place for the in-city terminal would have been Phaya Thai station, adjacent to the BTS Skytrain. Better synergy with the transit systems. The express train to the airport is quite nice. The station is air conditioned and well signed, if lacking in taxis. 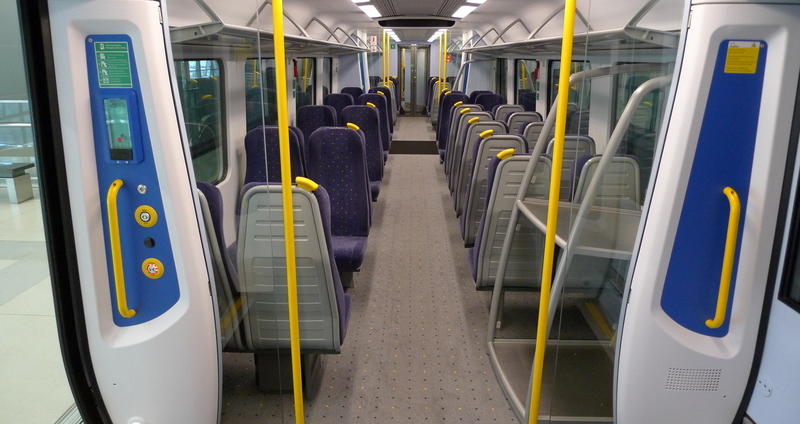 The trains run every fifteen minutes and the cars are comfortable with forward and rear facing seats, luggage racks, and overhead storage for small items. The train is also very fast – top speeds supposedly of 150 kmh, but I think it is more like 120 most of the way. 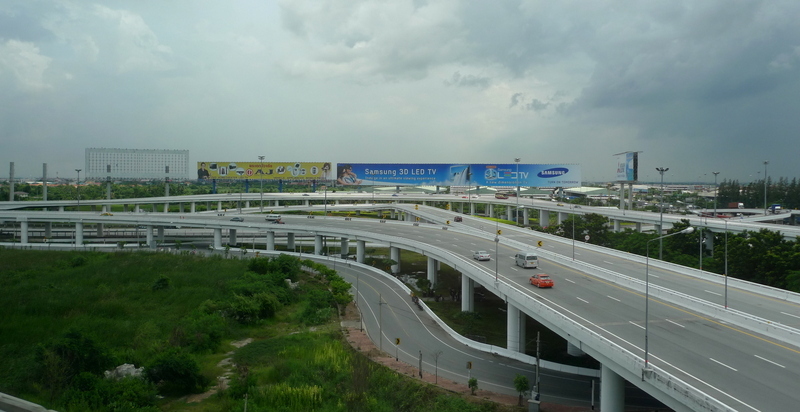 A view of the roads leading from the highway to the airport as we zoom past, arriving exactly fifteen minutes after leaving Makkasan. My assessment: The system is a very welcome addition to the transit network here in Bangkok. The local line, which connects from the airport directly to the Skytrain with six intermediate stops, is very useful and will probably do a lot of business, what with the rapidly-expanding suburbs to the east of the city. The airport express itself isn’t useful as you pay more and wind up at a station that isn’t convenient to anything. My advice – if you are arriving in the city and want to use the train, use the local line. Or, if there are more than two of you, take a taxi. In another two or three years, once the connections to the Makkasan station have been built and it is more convenient, I might revise my opinion. This entry was posted in Uncategorized and tagged airport, Airport Express, Airport Link, Bangkok, Krungthep, rail, Rapid Transit, Suvarnabhumi, train, transit by christao408. Bookmark the permalink. Another two or three years….or more, I suppose? But at least, there’s another way of getting into the city without the need of those clueless taxis drivers. Hi Chris, some people on Thai MTB reported that they do allow “FOLDING BIKES” on to the train! That’s a lot of rural area being cleared… I hope it works well. 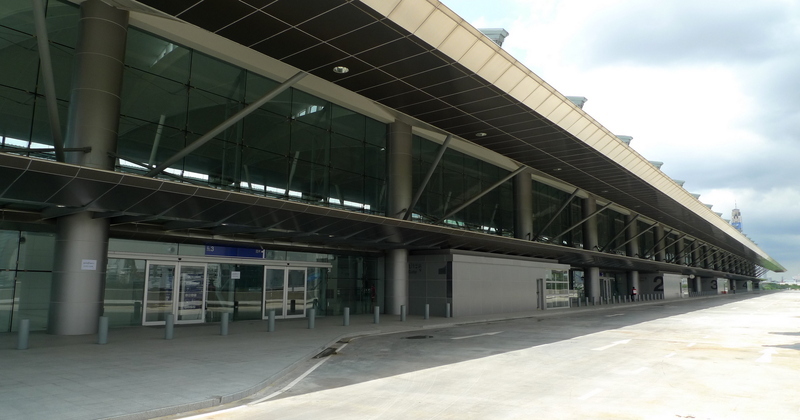 Is Don Muang airport still around? Glad to hear they finally opened the thing. I was looking forward to it but with a lack of connections (to subway, taxis, etc. ), it is of not so much use at the moment. The Airport Express Line opens this month here in Delhi. Over the last few weeks, a few other line have opened up and the Phase II of the Delhi Metro is getting wrapped up this month. Having a new and efficient transit system would indeed offer much convenience to everyone especially tourists. I hope I can visit Bangkok again someday, and maybe get to ride train. You did pick out some of the problems I think will be faced here as the state is looking to build similar expresses to major cities and airports here. It would be nice if one did not have to walk up and down steps to connect – particularly if carrying luggage! @christao408 – it would be great if some of these old carriages and trains (and maybe even buildings) could be saved. It would make an interesting mini museum and a nod to the past. @ElusiveWords – There is actually a railway park/museum up closer to DMK airport, on some other former State Railways property. They have some restored old trains. @Wangium – I don’t know that the connector bridge was all that dusty, I think it is the color of the stone. But there was definitely some construction going on right where the two stations meet – hammering, drilling, etc.Would be fantastic to have you guys visit and we’d be happy to show you around. That look very nice. I never been to Thailand. I have to tried it when i got a chance.